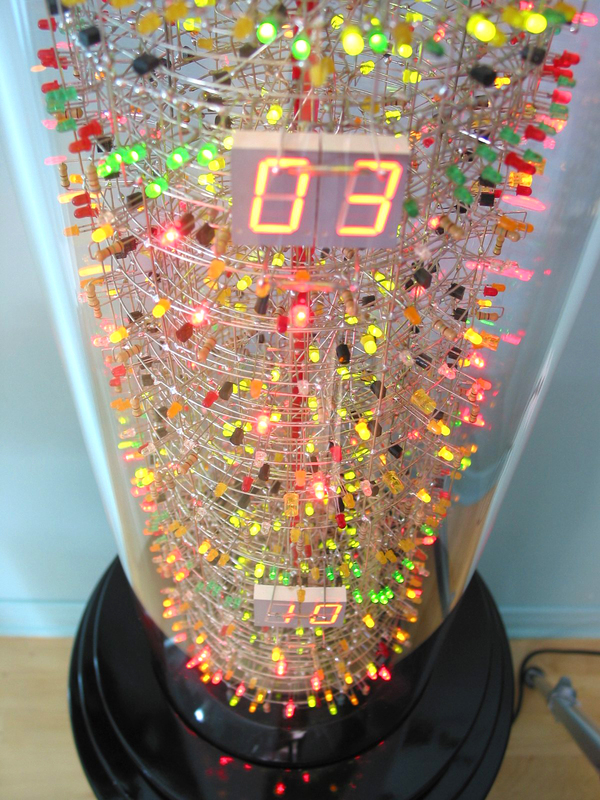 Introducing 'The Tower', which features a unique design concept, allowing the viewer to see the electric pulse of the circuitry by using leds rather than diodes. Overall bringing life into the piece of art. 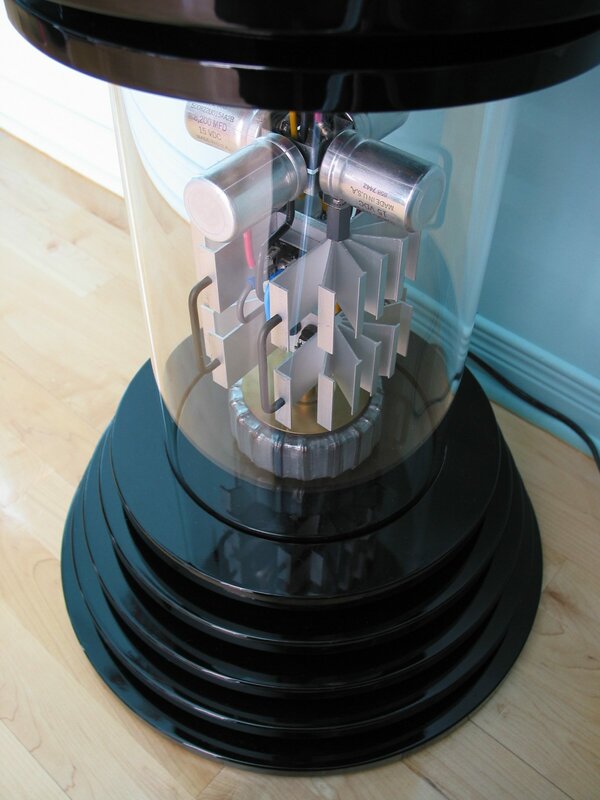 The top part of the tower contains the sculpture which is handcrafted using thousands of elementary electronic parts all enclosed in an elegant glass cylinder. and the bottom part has its power supply flooded into a neon light. The diodes, which are one of the 3 basic electronic components that composes any microchip, have all been replaced by colorful light emitting diodes also known as LEDs. This adds a completely new dimension to the design. Unlike modern circuitry where everything is enclosed and where the parts feel lifeless, now the viewer can actually see the sequences of binary signals flowing throughout the circuitry of a microchip. It's a lot like the first computers, which had hundreds of blinking lights and switches. 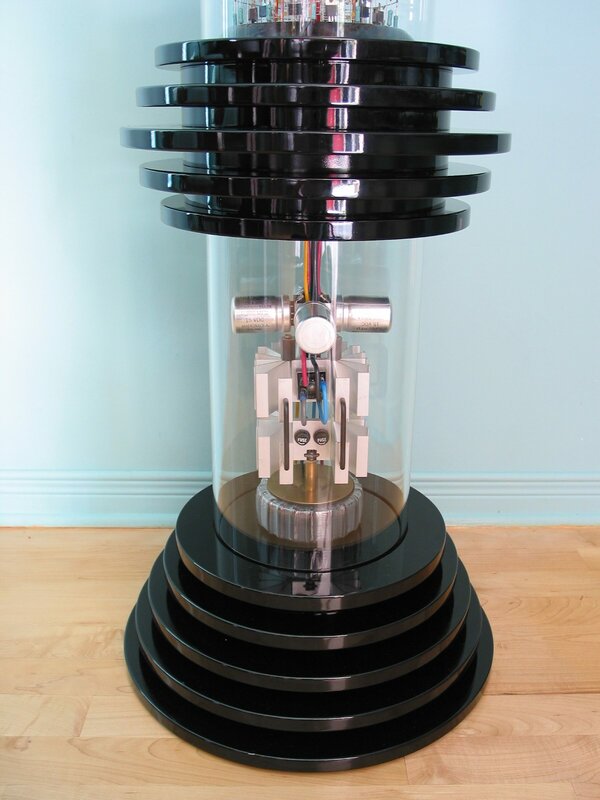 Furthermore In the center of this three-dimensional design, you will find the 'DNA core'. 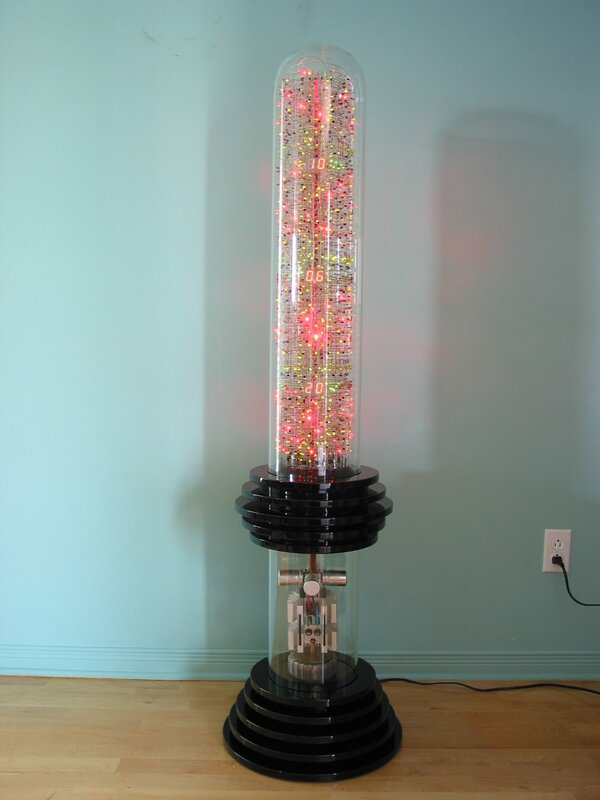 It's made from an array of LEDs wrapped around a 60 big red LEDs column, all shaped into a cool spiral shape. 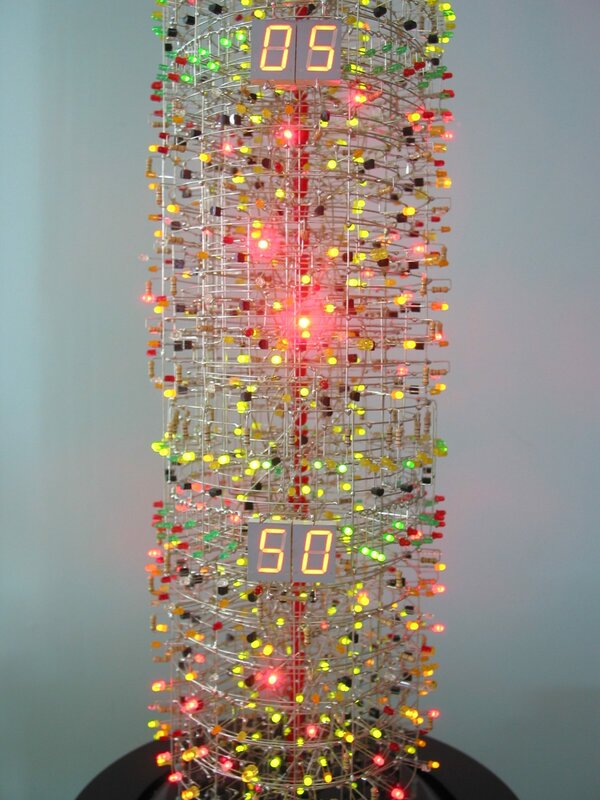 The vertical 60 red LEDs array clearly shows the flow of time because every second the top LED will light and drop down subsequently to the bottom one. Giving an hourglass feeling to it. The LEDs that form the helicoidal wrapping from the DNA core lights up following the instructions of the binary sequence, which is coming from another set of wrapping rings found around the DNA core called binary counters. 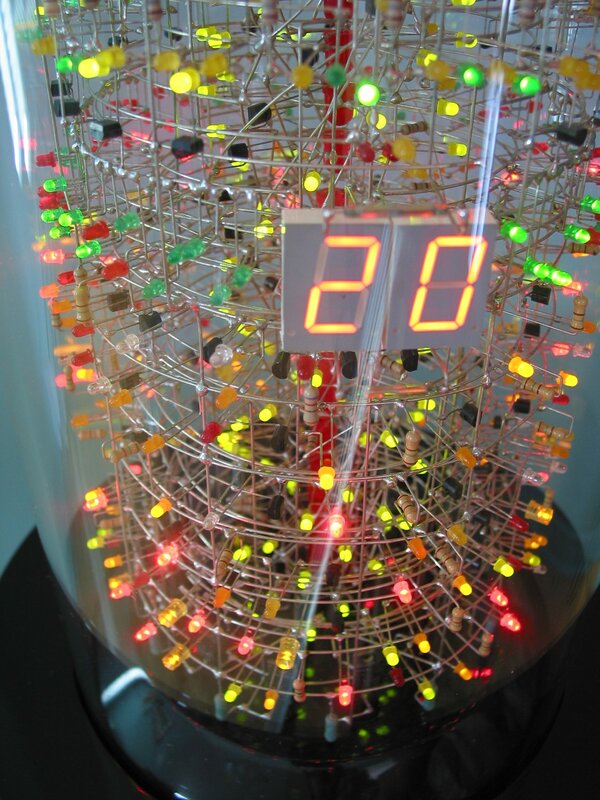 These counter rings also have their own set of LEDs, blinking in sync as they count the time elapsed. It is very difficult to have an accurate picture of the description cited above by only reading the text. There are over a thousand LEDs flashing in every section of the tower, revealing the synchronized flow of electrons throughout the circuits. 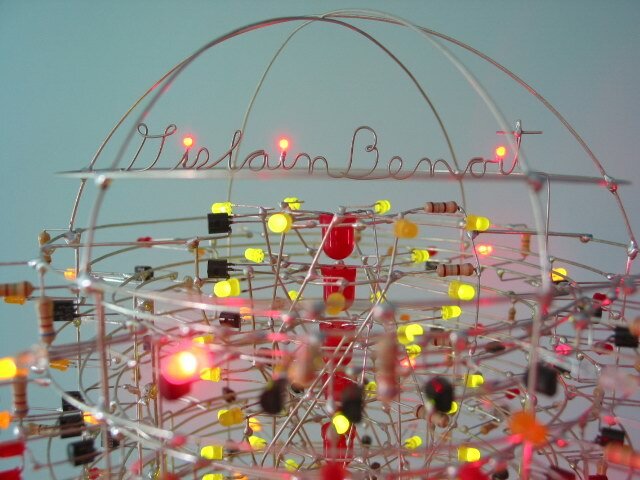 The bottom part of the project is a symmetrical structure of electronic components that form the power supply of the sculpture. There are no LEDs in that part of the design since there is no binary activity down there. 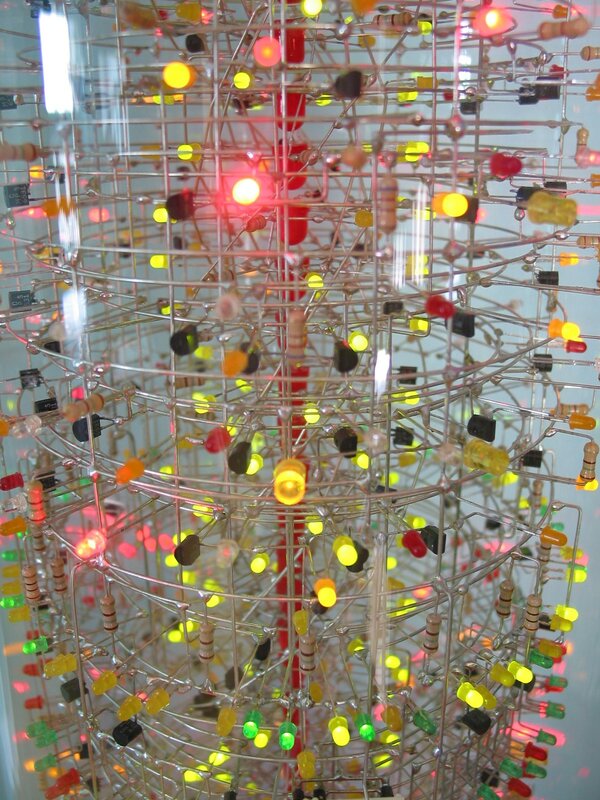 Instead, the whole power supply is flooded into a warm amber neon light that blends with the rest of the sculpture. As you can see in the following image, all my works of art are individually signed ! twenty wooden MDF disks sprayed with black base coat and clear coat layers. 2153 Total number of parts. Pyrex tube diameter: 8 inches.